The pergola with grape vine and hop growing up and over it in the summer sun. 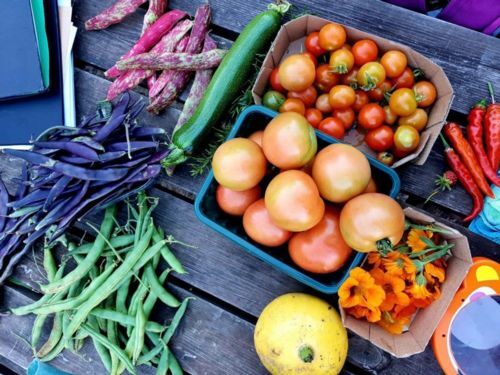 The Erleigh Road Community Garden is a hidden gem in East Reading offering a beautiful green space where you can come along and help grow fruit, vegetables and flowers. From March to October we hold twice weekly gardening sessions, and everyone is welcome from experienced gardeners to those who have not gardened before. Any produce that we harvest is shared out at the end of the session with the people who have helped that day. Mary volunteers at the weekend session and makes delicious cheese scones, brownies and hot drinks as an extra bonus! 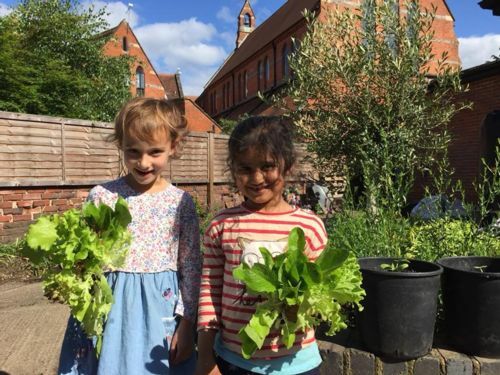 We hold additional events throughout the year such as cooking sessions using produce from the garden (for example pizza making, vegetable kebabs and fruit muffins), wildlife events such as moth and bird counts, art classes, gardening workshops and children's’ holiday events. 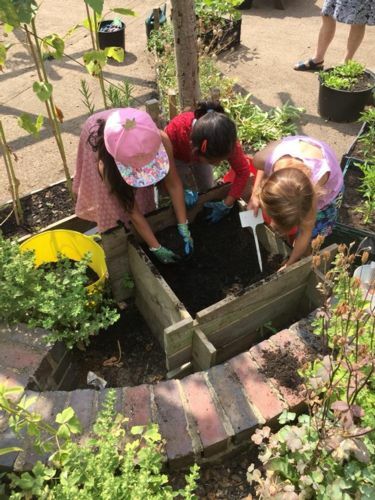 We have close links with Redlands Primary School and pupils at the school come and use the garden too. 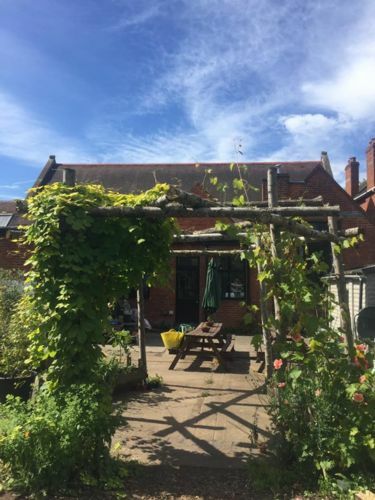 The garden gives people in the area the opportunity to get outdoors, meet other people in the community and enjoy gardening and nature in an otherwise very urban environment. We are always looking for new volunteers and welcome ideas of additional sessions or activities we can run so please get in touch if you are interested! The garden was set up on a disused area of land behind St Lukes’ Parish Hall. Garden tutors - Naomi German and Dave Richards – worked together to come up with a design for the garden at the start of 2017. The circular bed as you come into the garden was planted up with herbs to create a herb bed with an impressive olive tree in its centre. A pergola was constructed so we could increase planting on the hard standing and over this grows a grape vine and a hop. The walls to either side of the garden were planted up with fruit trees and these are trained along the wall to maximise space and there are fruit bushes too. The main area is for growing vegetables and flowers. We also have a mud kitchen for our younger visitors! We were all really proud to receive the Jessica Cecil award for our contribution to Reading’s environment at the 2017 Reading in Bloom event. 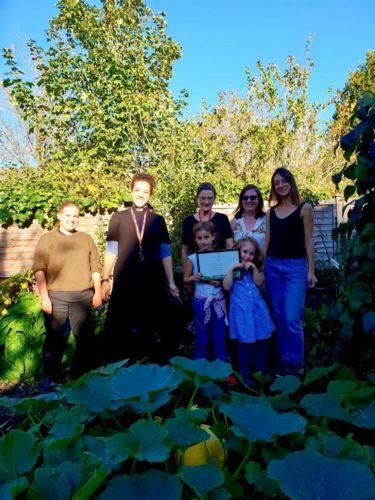 We also came second in the Best Community Garden category in 2017 and 2018. A raised bed to assist growing in a restricted area. Lots of different vegetables and spices grown in the community garden. A summer harvest of different lettuce leaves. Proudly holding one of the awards to this particular garden. For further information please contact us or go to our facebook page.